Peaceful Bay has easy, firm, protected beach launching with a small jetty to assist launch and retrieval of your vessel. From there navigate the well-marked passage out from the bay and find an abundance of fish harbouring structure at any depth. The continental shelf off Peaceful Bay is an amazing place, if you study it close enough you can see a 15 nautical mile chunk of the shelf has broken away and created a magnificent series of canyons. The heads and steep edges of these canyons lend themselves to great deep water fishing. 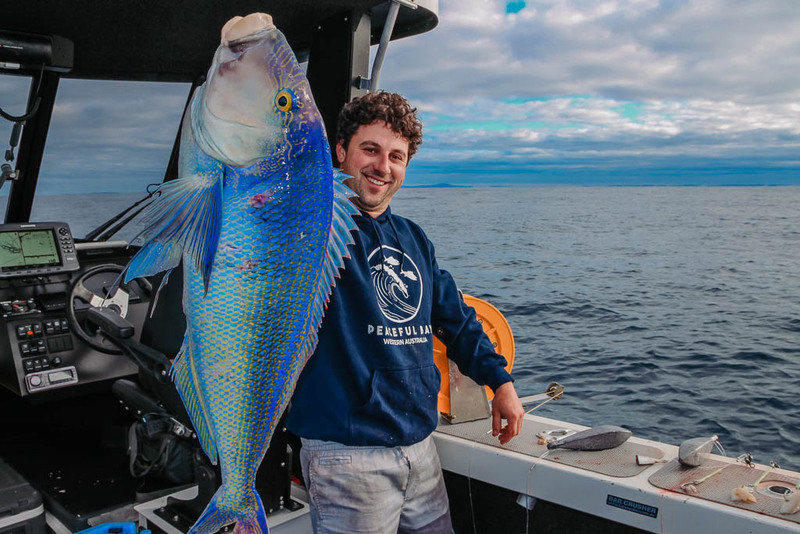 Load up your reels with heavy braid, circle hooks and heavy sinkers or big jigs, crank up the transducer and get stuck into shelf size nannygai, pink snapper, hapuka and bar cod or venture a little further and drop a line for blue eye trevalla. Nothing melts away the stress of everyday life like fishing from the beach. Feed your sense of adventure, lower the tyres in your four wheel drive and head out exploring the beautiful sheltered bays. They are safe enough to fish with kids and teeming with inshore fish life, you can fish from the beach or dive the rocky bays and hunt for abalone. During the autumn and winter months big schools of salmon maraud through, hunting schools of pilchard and herring on their annual migration along the coast. There are a number of rock platforms offering direct access to deep water demersal and pelagic fish all the way along Point Irwin. Prepare yourself with the necessary safety gear and try your hand targeting big pelagics like kingfish, sampson fish and bonito and demersals like groper and snapper. If you’re planning to head out rock fishing it is imperative that you check the weather report and assess the prevailing conditions, the South Coast ocean can be unpredictable and dangerous. The inlet at Peaceful Bay is a productive estuarine system, with a water body in excess of 1000 hectares alive with fish. 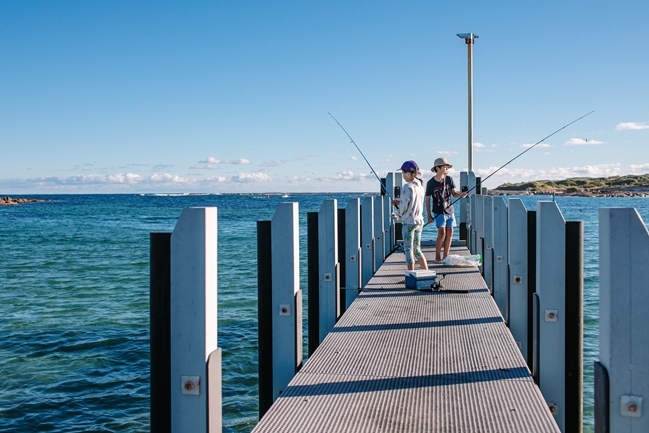 There is an abundance of species to target from the beach or dinghy, hunt for whiting, flat head, flounder, bream, as well as scooping the shallow flats and seagrass beds for cobbler, prawns and blue swimmer crabs. 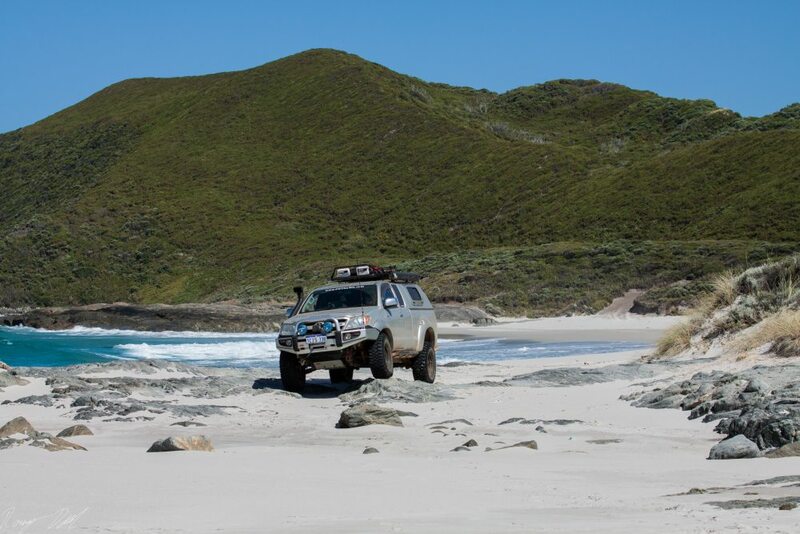 Peaceful Bay is a spectacular location for 4WD enthusiasts. 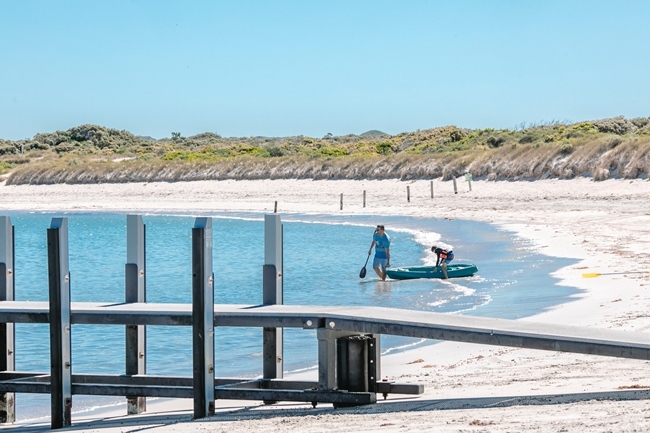 The crystal clear coastal waters, white sandy beaches, expansive inlet, National Parks and rocky headlands all contribute to the fun and adventure on offer in this amazing place. Take time to swim, have picnics, walk the trails and surf while on your four wheel driving journey. There are kilometers of great 4WD tracks that the whole family can enjoy, beautiful coastline to explore and there are some awesome spots for surfing and fishing. All in all, this is a fantastic destination to visit on your next 4WD holiday. An excellent snorkel site protected by huge granite rock formations, which protect it from the ocean swells, its easily accessible in most conditions, with a rich diversity of fish and other marine life, close to shore and an exceptionally beautiful beach and bay. Known as one of the best beaches on the South Coast, Peaceful Bay is the perfect spot to spend an afternoon relaxing, swimming and snorkelling. The white, sandy shores give way to pristine waters harbouring an abundance of marine life. Dive into the pristine waters at Peaceful Bay to swim or snorkel and be instantly immersed in an amazingly diverse South Coast inshore marine ecosystem. Peaceful Bay is the perfect location on the South Coast for stand up paddle boarding and canoeing. The water is crystal clear and the swimming bay is very well protected. You don’t require a 4WD to access Peaceful Bay which makes it a great option for those who prefer to walk down with their equipment. Another great location for water sports enthusiasts is the beautiful Irwin Inlet, only 3 kilometers from the swimming bay! Come and explore some of the famous breaks as seen in the epic surf movie based on Tim Winton’s novel of the same name, Breath. Peaceful Bay is the perfect base to explore the surf spots for which the Great Southern is famous for. From fun little beach breaks, to peeling reef breaks to the monster slab of the world famous big wave ‘The Right’, there’s a wave for all levels of surfing ability.